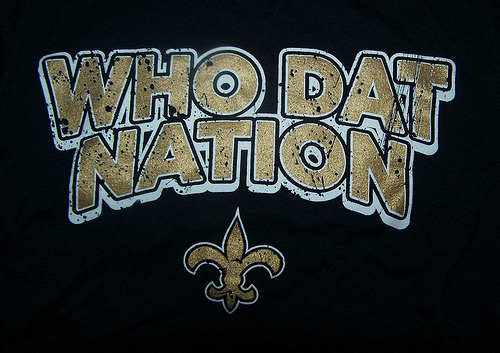 I'm an honorary member of Who Dat Nation...there ain't no ain'ts here. Okay, it’s Super Bowl Sunday, and the Saints are representing their benighted hometown with style, grace, and with strength. So you know where I stand. I may not be a true member of Who Dat Nation, like I am not as much a true member of the Forty Niner Faithful as my youngest brother is. These people are true believers, through thick and thin, losing years through contender years. However, as I was there when the Niners got the first of their Bowl visits, some four years after the tragedies at Jonestown and at City Hall, I am proud to have been a resident of a united and proud San Francisco. And I’m proud to be a native-born daughter of New Orleans, Louisiana, who rises slowly from the mud of Katrina and broken levees, and the muck of gang warfare, corrupt politics, and grasping corporate interests. Yesterday, February 6, the son of the last white mayor of New Orleans, former Louisiana Lieutenant Governor Mitch Landrieu, became Mayor in his own right. He bested 10 other candidates for the win; more about this here, and even more later on the first page. I can’t believe it. No more Nagin. The Super Bowl is today, February 7. Celebrations are occurring both in New Orleans and in Miami. Some Who Dats? and Bowl followers prefer to party in New Orleans rather than in Miami, and not just because they are closer to home. There is nothing like partying in the party capital of the United States. Mardi Gras or Carnival season has already started; there are usually parades and other balls and parties nearly every other evening. Mardi Gras falls on Tuesday, February 16. Wish I were there. To smell that gumbo, that crawfish boiling, to witness those spectacles, to feel that excitement. Hope you get there sometime soon.